After a frustratingly long and often way-too-cold winter, it finally feels like spring might be on its way, and I for one couldn’t be any more delighted. The tulips and daffodils are tentatively peeking up from the garden beds, the robins are chirping merrily in the trees, and slowly but surely the evening light lingers just a little later each night. And as always seems to happen this time of year, I find myself craving all the flavours I associate with spring. I want fresh, green flavours like asparagus and artichoke, the freshness of citrus, and sweet maple syrup. Most of all, though, I find myself dreaming of that bright astringent pop of rhubarb. 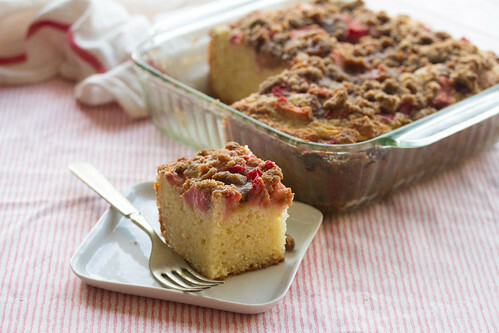 Conveniently enough, my hankering for rhubarb just happened to coincide almost exactly with National Coffee Cake Day. Clearly a sign from above, right? So to celebrate, I took my favourite recipe for a classic, old-fashioned sour cream cake with a sweet brown sugar and cinnamon streusel and gave it a fresh new look for spring. 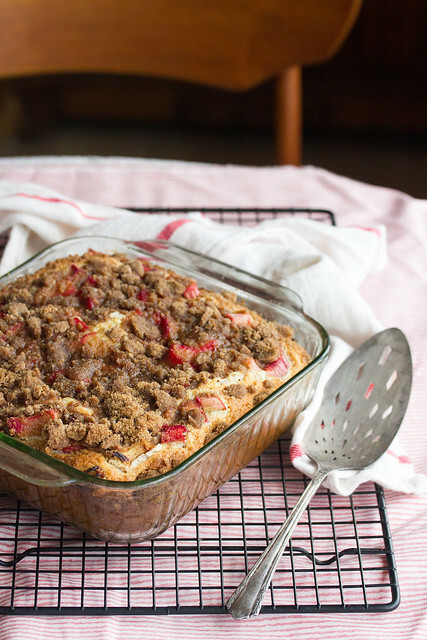 I started by infusing the batter with lots of bright lemon zest, and then I topped it off with a layer of chopped rhubarb before sprinkling with streusel. It’s got all those spring flavours I’ve been craving. It’s everything a coffee cake should be. 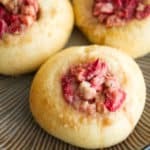 Dense and buttery, just the right amount of sweet, and loaded with all of the bright rhubarb flavour I’ve been craving. This is the easy spring dessert you’ve been looking for, whether it’s as the centerpiece to an afternoon tea break, a potluck at the office, or the sweet finale for a springtime supper. Not a fan of rhubarb? No problem! This cake is equally lovely topped with sliced fresh strawberries, wild blueberries, raspberries, blackberries, or even a mix of all of the above. It’s honestly that versatile! 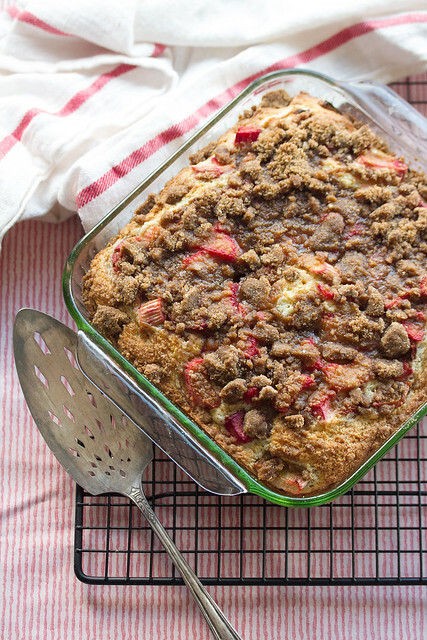 The traditional sour cream coffee cake gets a fresh spring makeover with this combination of bright lemon zest and tangy rhubarb chunks under a sweet cinnamon streusel. In a small mixing bowl, stir together the brown sugar, flour and cinnamon. Using a fork, stir in the butter until the mixture is crumbly. Set aside until ready to use. Preheat oven to 350F. Lightly butter a 9×9 square baking dish. In a large mixing bowl, beat the butter and sugar together until combined. Beat in the eggs, one at a time, then stir in the sour cream, lemon zest, lemon juice and vanilla. In a separate bowl, whisk together the flour, baking powder, baking soda and salt. Add to the wet ingredients, and stir together until just barely combined. Spread the batter into the prepared baking pan. 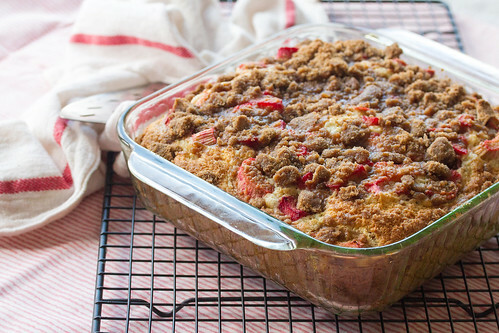 Sprinkle the chopped rhubarb onto the batter in an even layer, then top with the crumb topping. Bake in preheated oven for 65 – 75 minutes, or until a toothpick inserted into the centre of the cake comes out clean. Place the pan on a wire rack to cool off completely before cutting into squares and serving. You can also make this cake using frozen rhubarb – just use the same amount of chopped frozen rhubarb, straight from the freezer. It’s National Coffee Cake Day! 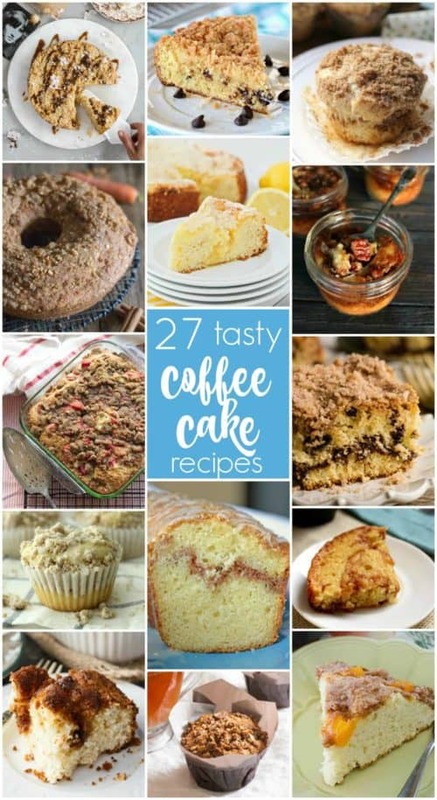 I’m joining up with a few of my favourite blogger pals to share our favourite coffee cake recipes. WoW ! Wonderful and yummy looking recipe of cake. Thanks for sharing. This is beautiful. Perfect for a treat any time of day. OMG the winter that will never end! We just had a blizzard the other night. Crazy. 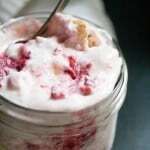 I have rhubarb growing in yard so I’ll be trying it with your recipe once the snow melts! 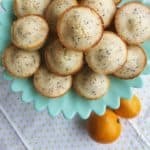 This looks like the perfect dessert to bring to a spring potluck or brunch! Or just to enjoy with a cup of coffee on a lazy Saturday morning! 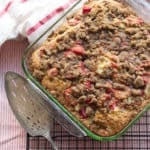 mmm do like the idea of coffee cake but am not sure about the rhubarb! So good to know I can try other fruits in it . Haha…for some reason I actually thought there was coffee infused in the cake but now just realized it is the name of the cake. I have a small bag of coffee grinds I have left from making coffee so am looking to do something with that too. Interesting flavours, I love coffee cake so I’ll have to give this a try. Coffee cake is such a wonderful classic! 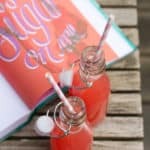 I’m loving that this includes lemon flavours along with the rhubarb, it looks & sounds absolutely delicious! If it makes you feel any better, Terri, it’s been snowing on and off for the last two days…. ah, the joys of spring in Canada!